Provisional plates are made of paper and were often used because a lot of time was required to get normal plates: today plates are given much more quickly and so provisional plates are mostly used for historical cars that are not registered and need a plate for exhibition, for the vehicles that have to be exported and suring the tests. I was told that you can easily see provisional plates in Maranello where Ferrari tests its cars. 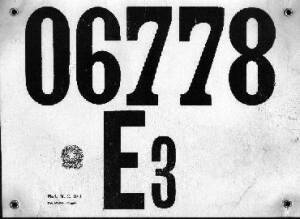 1914-1928: provisional plates were introduced in 1914 and the first plates were square (about 20 x 20 cm), made of cardboard, with the number of the province (see table) and a serial number in black on white. 1928-1933: in 1928 provisional plates changed: the shape became rectangular and they had a serial number on the left, followed by two letters for the code of the Railway District that issued the plate, according to the first table below. These plates were made of cardboard, but they could be replaced by metal plates. The color was not specified by the law and so various combinations were possible (probably the background usually was white). 1933-1959: provisional plates changed changed their format in 1933: on the top line there was the province code, as shown in the second table below, and on the bottom a serial number of 4 digits. They were still issued by the Railway Districts until 1945 and after the Second World War they were made directly by the Italian Motorizzazione (department of motorvehicles) and the symbol of the Italian republic was added. 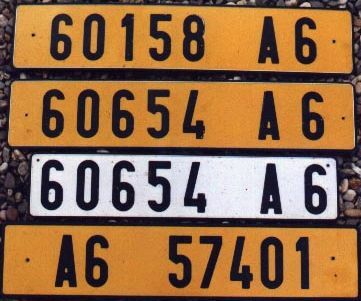 You can see one of these plates in the first picture (made in 1952); anyway there were also some provisional plates with the province code on the second line and the number on the first, as you can see in the second picture. 1959-Today: in 1959 there was the last change of provisional plates as they're still today and you can see one of them in the third picture. They have got a serial number of 5 digits, with leading zeros if needed (when 99999 is reached, it starts again from 00000) in the top line and the seal of republic and two digits A0 in the bottom line. 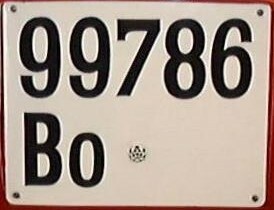 The last two digits show the origin of the plate and a special provincial code is used. The letter is the region code, while the number is the province of that region... give a look at the table for a full list of all the codes. Moreover provisional plates for motorbikes were introduced, while there are not front provisional plates, even if sometimes they are arranged by the owner. A small modification was made in 1994: Trieste changed its code (see table) and all the digits were arranged in just one line, with the origin code followed by the number. It's possible to find Italian provisional plates, from areas near the French border, on French style plates, as you can see in the fourth picture. As you can see the origin code (A6 stands for Torino) can be both on the right or on the left and it's black on reflective yellow. The white plate in the picture is a front plate (same number of the plate above! ), but as said, front plates are not official. On this web site you can find also two more provisional plates: one was used in the Italian East Africa when Italy occupied Somalia and Eritrea, and the second was issued for the Italian Red Cross. I want to thank Adolfo Arena for the first picture, Jean-Emmanuel Chevry who sent me the pictures number 2 and 4, Rutger Stolk for the picture number 5, John Schatorjè for the last one image and Guglielmo Evangelista for his history about these plates. The third picture is taken from the issue of April 2000 of "La Manovella".